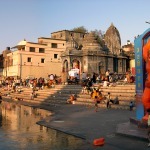 Nashik has a personality of its own, due to its mythological, historical, social and cultural importance. The city is situated on the banks of the Godavari River, making it one of the holiest places for Hindus all over the world. Nashik has a rich historical past, as the mythology has it that Lord Rama, the King of Ayodhya, made Nashik his adobe during his 14 years in exile. At the same place Lord Laxman, by the wish of Lord Rama, cut the nose of “Shurpnakha” and thus this city was named as “Nasik”. In Kritayuga, Nashik was ‘Trikantak’, ‘Janasthana’ in Dwaparyuga and later in Kuliyuga it became ‘Navashikh’ or ‘Nashik’. Renowed poets like Valmiki, Kalidas and Bhavabhooti have paid rich tributes here. Nashik in 150 BC.was beleived to be the country’s largets market place. From 1487 A.D, this province came under the rule of Mughals and was known as ‘Gulchanabad’. It was also home of emperor Akbar and he has written at lenght about Nashik in ‘Ein-e-Akbari’. It was also known as the ‘Land of the brave’ during the regime of Chhatrapati Shivaji Maharaj. No one knows when the city of Nashik came into existence. It is stated to have been present even in the stone age. Lord Ramchandra along with wife Sita and brother Laxman settled down in Nashik for the major time of their “Vanwasa”. According to the mythology, Laxman cut the nose (“Nasika” in Sanskrita) of “Shurpanakha” and hence the city got the name ‘Nashik’. Long ago, Brahmadeva had meditated in “Padmasana” here, so the city was also called “Padma-Aasana” for some time. It is also believed that, Lord Vishnu had defeated the three demons and thus city also had the name “Tri-Kantak” (Tri = Three). In the recent past, the Moguls were fascinated by the beauty of the city and renamed it as “Gulshanabad” meaning the city of gardens. Beautiful fresh flowers were sent to Aurangazeb from Gulshanabad i.e. Nashik. But it was during the rule of the Peshwas, when the place was finally renamed as Nashik. During the Peshwas period, Raghobadada and his wife Anandibai settled down at ‘Anandwalli’ in Nashik. 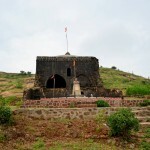 There re some remains of Anandibai’s fort. There is also a temple called ‘Navasha Ganapati’ built by Anandibai. It was during the British rule in April 1818, when Nashik once again regained its importance. The British fell in love with the beauty of the city and developed it in various fields. The Golf course, developed by the British, was one of the largest in Asia. 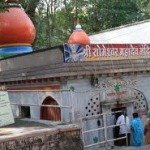 Nashik is surrounded by nine hills, namely: Durga, Ganesh, Chitraghanta, Pandav, DingerAli, Mhasarul, Jogwada, Pathanpura and Konkani. This beautiful city with hills surrounding it has lakes, adding to its beauty. In 1869 the region came to enjoy unbroken peace. In 1869 Nashik was made a full-fledged district with its present talukas. With the return of peace Nashik flourished into prosperity. Reasons, political, religious, as well as commercial led to its rapid development. With the construction of the railway, going from Bombay to north-east, from very near the city, religious minded devotees came to be attracted to The town in ever increasing numbers where they made their purchases of various artistic & useful articles. This made Nashik a great trade centre where artisans skilled in manufacturing utensils & smiths excelling in workmanship in silver & gold crowded to ply their trade. Already Nashik was a highly flourishing town even under later Maratha rule & some time during that period the sow car families like barves, Vaishampayans & Gadres of the locality started their financial activity. Under Maratha rule they advanced sums to finance military campaigns of feudal Sardars & in their later times their Pedhi’s gradually began to finance the flourishing trade in metalware & fabrics as well as grapes & onions. By the middle of 19th century the British Rule was firmly established & the public life of Nashik began to pulsating with activities suited to the times. In 1840 was established a ‘ Native Library Nashik’ . In 1861 an Anglo-vernacular school was started & 1864, The town came to have a municipality of its own. During these days there lived in Nashik a saintly person, known as Dev Mamaledar. His name was Yeshvant Mahadev Bhosekar. He began his career as an humble clerk in the revenue department & gradually rose to the position of Mamaledar. He always had a feeling for the poor & the suffering. During the period of his service as a Mamlatdar in Baglan Taluka which has its head quarter at Satana , A severe famine affected the area & Bhosekar generously helped the people to alleviate their sufferings. He always led a virtuous life & spent his spare moments in devout religious practices. In course of time he became so famous that princes & people began to respect him as a saint & called him Yeshvantrav Maharaj. Upon his death in 1887 people raised a small beautiful temple for his Samadhi on the bank of the river where his last funeral rites were performed. The paved floor around came to be known as Yeshvant Patangana which has now become a great centre of public assemblage & activity. 21st December 1909. Anant Kanhere shot the collector Jackson in Vijayanand theater. The murder of Jackson challenged the British Rule. The people involved in the incidence, Anant LaxmanKanhere, Krishnaji Gopal Karve and Vinayak Ramchandra Deshpande were sentenced to death. It wasduring this time that ‘Abhinav Bharat ‘ was formed. The young Nashikites were influenced by the speech of Lokmanya Tilak given on the 26th of August 1906. Veer Savarkar successfully organised underground movement against the rulers. If Italy be free, why not India ? If Ireland be free, why not India ? The evidence in this case establishes that prior to the year 1906 , an association of young men , mostly Brahmans, existed in Nashik under leadership of Ganesh & Vinayak Savarkar which was known as the Mitra-Mela. In it were reproduced the features of other similar associations in the Deccan to which reference has already been made. Exciting songs were prepared for the Ganapati & Shivaji festivals & the members of the Mitra-Mela used to join in singing these songs either in procession or in the precincts of some temple or other place of assembly. Physical instruction was given to members by one of the witnesses in this case & by a Mahomedan brought for the purpose from Baroda. The activities of the association did not, however, cease there, for we have evidence, which we accept as true, that meetings were held at the house of Ganesh Savarkar & of Aba Darekar, one of the song-writers of the association, at which the biographies of patriotic revolutionists were read & re-read, the particular favourites being Mazzini, Shivaji & Ramdas & where discusssions were carried on with regard to the means for attaining independence for India. At these meetings the methods advocated were the education of public by means of lectures, books & songs, & the preparation for rising against the British Government by collection of arms & ammunition. We have examples of inflammatory speeches delivered by Vinayak & Narayan Savarkar & by Mahadev Bhat, & a photograph of number of members of the Mitra Mela, several of whom are among the accused, grouped round Vinayak Savarkar in which four or five pictures of Shivaji, A board bearing the words “Bande Mataram” & a book bearing the name of Mazzini on the outer cover are prominently displayed, which corroborate the general description of the aims & methods of the association given by the witnesses. The photograph Exhibit A-271, to which referance has been made, marks an important stage in the history of the association . Its occasion was the impending departure of Vinayak Savarkar for England in the middle of June 1906, a step which he was enabled to take owing to his being the recipent of a scholarship given by Shamji Krishna Varma, the founder of the India House at Highgate. Up to the time of his departure Vinayak Savarkar had been one of the most active & probably the most stimulating of the members of the Mitra Mela. In the early part of 1906 speeches were delivered by him in Poona & in nashik the object of which was to arouse the country & to suggest how by means of mental training & physical exercises, preparation might be made for successful revolt. Anant Laxman Kanhere 21st December 1909 21st December 1909. Krishna Gopal Karve 24th December 1909 6th January 1910. Vinayak Narayan Deshpande 23rd December 1909 6th January 1910. Shankar Ramchandra Soman 23rd December 1909 6th January 1910. .Waman Daji Narayan Joshi 30th December 1909 4th January 1910. Ganesh B. Vaidya 22nd December 1909 2nd january 1910. Dattatraya Pandurang Joshi 22nd December 1909 5th January 1910. Before the departure of Vinayak Savarkar the Mitra Mela had developed into or given birth to the Abhinav Bharat or Young India Society a title which the prosecution suggests was borrowed from the “Young Italy” of Muzzini. Its objects were unquestionably revolutionary. The aim of its members was to be prepared for war. The list of objects enumerated in Exhibit 9B found in the possession of Kashikar in 1909 affords ample corroboration of the evidence of witnesses upon this point. After matriculation in 1901, he took admission in Fergusson College of Poona. He was however more interested in India’s freedom from British rule. The young college students in Poona were charged by the speeches by the patriots and political leaders like Bal Gangadhar Tilak, Bhopatkar etc. The news papers in Poona were also actively participating in creating anti-British atmosphere in the society and appealing society’s feelings of Nationalism. Savarkar was the uncrowned leader of the youth in this movement. In 1905 he burnt the imported clothes as a token of India’s protest to imported clothes. In May 1904, he established an International Revolution Institute named “Abhinav Bharat”. His instigating patriotic speeches and activities irritated the British Government. As a result his B.A. degree was withdrawn by the Government. In June 1906 he left for London to become Barrister. However, once in London, he united and inflamed the Indian students in England against British. He believed in use of arms against the foreign rulers and created a network of Indians in England, equipped with weapons . Although he passed Barrister Examination in England, because of his anti-government activities, he was denied the Degree. He was the prime inspiration for the Indian students to rise against British rule. The British Government Officers were waiting for some opportunity to arrest him. He was arrested in London on 13 March 1910 on some fabricated offenses. The case against him was to be heard by the court in India. So he was to be sent to India. During his travel in a ship, as the ship neared Marseilles in France, he jumped through a porthole and swam to the port. This was on 8 July 1910. As per the plan, his colleagues were to reach there beforehand. However, they reached late and he was caught by French Police. The French Government denied him asylum. After the case was decided in India, he was sentenced to 50 years rigorous life imprisonment in Andaman on 24 December 1910. Since 4 July 1911, he was in Andaman Jail in solitude. On 2nd May 1921 he was brought to India from Andaman. Since 1921 to 1922, he was in Alipur (Bengal) and Ratnagiri (Maharashtra) Jails. On 6th January 1924, he was released from the jail on two conditions viz. a) He will not actively participate in politics and b) he will stay in Ratnagiri District. He was in house arrest at Ratnagiri. Thereafter he spent his life in different fields of social work. He breathed his last at the age of 83, on Saturday, February 26, 1966. “Prayopveshana” , meaning fast till death, was what he observed and refused any intake of food. His death was like a true warrior. Death did not grab him, he approached death with erect head. The books of verse composed by members of the socitey known as the “Laghu Abhinav Bharat Mala” were printed & published in Bombay & Sholapur & were for a long time openly sold though of a most inflammatory character. The publisher of four of the earlier issues of the above series departure for England in 1906 & an edition of 5,000 copies was published in September of that year. This series of publications culminated in 1908 with the issue by Ganesh Savarkar of Fiowers 8 & 9 containing a clear incitement to war against the British. They resulted in the arrest of Ganesh Savarkar on the 28th February 1909 & his subsequent conviction & transportation but not before he had made arrangements for the reception in Bombay of a consignment of Browning pistols which were originally destined for Nashik. The supreme sacrifice of Anant Kanhere , Krishnaji Karve & Vinayak Deshpande is a glorious chapter in the history of Nashik. The begining of 20th century witnessed increase in atrocities by Britishers on the innocent Indians . Lokmanya Tilak was put behind the bars for 6 years . Babarao alias Ganesh Damodar Savarkar was sentenced to life imprisonment for publishing the patriotic songs of his younger brother Vinayak Savarkar . Jackson , the then collector of Nashik , was responsible for prosecution of Babarao Savarkar . He tortured Waman Sakharam Khare , a well-known lawyer , so much that Khare lost his mental balance . The only ‘offence ‘ of Khare was : he pleaded for revolutionaries. All these incidences evoked a sharp reaction in the patriotic youths of Nashik . The last straw came when a British officer beat a farmer to death for not allowing his vehicle to overtake . When the situation was heating up to the boiling point , Jackson was transferred on promotion outside Nashik . Kanhere & his friends made up their minds : It’s now or never ! A farewell ceremony was arranged for Jackson in the Vijayanand theatre . A famous Marathi drama Sharada was staged to mark the occasion . Anant Kanhere & his friends were all set to execute their plan . Anant grabed the opportunity & fired at Jackson. As per the plan , Anant tried to commit suicide but he failed to do so . He used one of the 20 revolvers which were sent by Veer Savarkar from England . The historical day was : December 21 , 1909. It was planned that only Anant should take entire responsibility of the assassination so that other conspirators would remain in dark . But it did not happen . The Police arrested Krushnaji Gopal Karve , Vinayak Narayan Deshpande , Shankarrao Soman , Wamanrao Joshi & Ganu Vaidya . All these youths were detained in the Sarkarwada & were treated brutally to know more about the conspiracy . The torturing Police team was headed by Alikhan who was reputed for his inhuman behavior. The prosecution of these brave youths is well-known in the history of India as ‘Nashik Conspiracy Case’ . · 1854 : Sharanpur Colony formed. 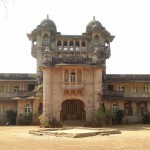 · 1861 : Deolali Cantonment formed. · 1862 : Nashik Road railway station was built. · 1864 : Nashik Municipality formed. · 1869 : Nashik district formed. · 1894 : Saint Andrew Church built. · 1894 : Construction work for Victoria Bridge started. · 1910 : Police Training School established. · 1922 : Distillery started at Nashik Road. · 1927 : Security Press formed at Nashik Road. · 1941 : Artillery Center migrated to Nashik Road from Quetta in Pakistan.